Let's face it - your employees love a good cause. That’s why businesses with a corporate philanthropy program consistently have happier, more engaged, and productive employees than those that do not. There are a myriad of ways companies can get behind the causes they care about and make meaningful change in their local and global communities. Matching gift programs are just one way to do that. They boost contributions and encourage employees to exceed their company’s philanthropic goals, while giving more dollars to charities. In their 2011 survey of corporate philanthropy, the Committee Encouraging Corporate Philanthropy (CECP) found that 94% of companies offered a matching gift program in 2010. CECP also found that matching gift programs “can be instrumental in attracting and retaining employees, as they foster goodwill and increase employee engagement.” It’s no surprise that there is an upward trend in program adoption or expansion. Of the firms surveyed, 57% increased their matching gift funds from 2009 to 2010 while 40 companies added a disaster relief matching program in 2010. 1. Encourage More Employee Donations and Engagement: Your employee donors will have an increased incentive to take part in workplace giving campaigns when they believe their donations have impact. Matching programs are of particular interest to employees who partake in charitable events like walk-run-bike marathons that have goals for teams or individual participants. By matching your employees’ donations, you’ll help them reach their goals faster while making it clear that you care about the causes they support.Employee engagement can increase through programs that make donations to match the hours an employee spends volunteering for a charity, a concept known as “dollars for doers.” Employees are more likely to spend their free time volunteering if they know that their company will financially support their efforts. 2. Be a Better Corporate Citizen: Pledging to match your employee donations will allow your company to have a larger social impact than it would with employee donations alone. In addition to doing more good, matching gifts can improve your corporate reputation. An excellent example of a company with matching gift and volunteer grant programs is Microsoft. The tech giant facilitates a very generous matching program open to US-based 501c3 nonprofits and educational institutions. Employee donations get matched dollar-for-dollar with a $25 minimum, while volunteer time gets $17 per hour. Last year alone, Microsoft employees (including company match) gave $113 million to 19,000 nonprofits! While it’s hard to gauge the impact of such efforts on corporate reputation, it’s safe to say that we all admire Microsoft’s altruistic approach to workplace giving. 3. Hassle-Free Charity Vetting: For companies that offer matches for predetermined nonprofits, the vetting process is much simpler since the selected charity has already been checked to make sure it meets corporate and legal requirements. For example, the Verizon Foundation includes pre-approved and vetted non-US based organizations and schools in their matching gifts program. 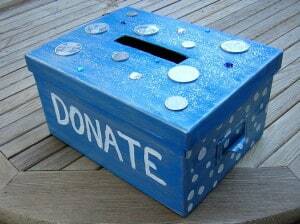 This ensures the nonprofits are eligible to receive employee and corporate funds before giving the donations. 4. Tax Benefits of Matching Gifts: As with most charitable giving, matched employee donations are often deductible for up to 10% of the company’s taxable annual income. However, since most state and federal laws on charitable contributions change, you should always consult your company’s legal counsel and tax professionals to decide if possible business tax deductions apply to your matching gifts program. If your company already has a matching gift program in place, great! Just make sure your employees know about it! According to Great Nonprofits, more than $10 billion in employer matching dollars is left on the table annually. This is primarily a result of little-to-no awareness of the program among corporate employees. If they don’t know it’s there, they won’t ask for it! We make this easier for our corporate clients by notifying employees directly from campaign sites that their company provides a match and exactly how much that entails. Companies can also use internal communication tools, such as newsletters, brochures, intranets and meetings to communicate the program’s existence. Regardless of the method, make sure the matching program is highly visible and easily accessible for employees.